Chicago, a great place to sail! It's the New Year, and time to start thinking sailing. This past year was a great one for Sail Chicago. We offered more classes, had more students, and graduated more skippers than ever before. Our membership ranks swelled to new highs. We added another Colgate to our fleet. And 2019 promises to be even better. We're streamlining our operations, making things run more efficiently, and we're revamping our volunteer program. Speaking of volunteers, let's give a shout-out to all our member-volunteers who worked so tirelessly to keep Sail Chicago afloat, fill our sails, and push us ahead. Without you we wouldn't exist. Remember, though, keep your service requirement up to date. If you're wondering if your requirement has been met or have questions about how you can meet it, get in touch with Frank McNamara, our Volunteer Coordinator (see article below). If you're looking for something to do while you're waiting to get back on the water, join us at the Chicago Boat Show, January 9-13 at McCormick Place where you'll find everything sailing. Climb aboard the latest cruising boats, attend a multitude of seminars, get yourself some new sailing gear at considerable discounts. And while you're there, stop by the Sail Chicago booth to say "Hello" and meet some new friends. Assistant Registrar: Assist students with course registration and related questions (remote). Membership Coordination: Assist with fielding emails/questions from current and potential new members (remote). Insurance/Licensing Coordinator: Maintain our insurance and individual boat licenses. Volunteer Coordination: Assist with documenting, coordinating and tracking member service time (remote). Winter maintenance opportunities are also available (please see Joe Cannon's article in this issue of Between the Sheets for further information). Please email me for further detail on these roles, to volunteer, or with any questions about previously completed service time. All kinds of work needs doing before the season starts. Second-year member looking for a service opportunity? Established member looking for something different? New teams are being created this winter to perform routine pre-launch tasks and non-routine equipment upgrades. Established members will be partnered with newer members to spread maintenance knowledge more widely through the organization. The teams will have the independence to accomplish their work according to their own schedules and the dictates of the weather. Not all projects need to be carried out at the yard: some can be done in member's garages or other interior spaces. A list of available projects can be found here. At this site, you can indicate interest in up to five projects. You will then gain access to an online collaboration hub where you can learn more about each project, ask questions, and provide suggestions (if you have experience with the tasks involved). Ultimately, you can commit to a project at this hub if it seems like a good fit. Resulting teams can use the hub to plan, coordinate, and schedule their activities. The maintenance coordinators will monitor progress and provide assistance every step of the way. There will also be a provision for suggesting projects not on the list. If you already have an established service role with Sail Chicago, there is no need to explore these opportunities. However, if all goes well, there will be fewer open calls for workers at the yard this spring. Ninety-one Sail Chicago members completed the survey that was fielded on November 5, 2018. Here are some top-line results. 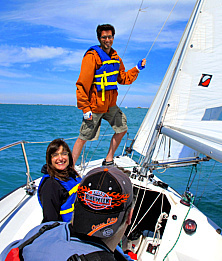 Overall, folks are very satisfied with their membership in Sail Chicago. They see it as a good value for the money and for their service time. More than 80 percent of members said they were "very satisfied" with our organization overall. Members overwhelmingly prefer Monroe Street Harbor for mooring boats. Easy transportation to the harbor is the clear deciding factor. Only one survey respondent listed Monroe Harbor as "Not good for me." Members are divided about the placement of Sail Chicago moorings in Monroe Street Harbor. Wave action makes it hard to transfer from tenders and to rig and un-rig the boats. Members are, therefore, concerned about the current location. But they also see the moorings as too tightly spaced, so there are clear advantages to being near the accessible edge of the mooring field. Transfer requests have been submitted to move some Colgates to the more protected, eastern ends of rows T, U, and V as well as row B. Any transfer depends upon mooring availability, so not many boats are likely to move next season. That will provide an opportunity to try new locations with only limited impact on the status quo." The Sail Chicago Board met at the Columbia Yacht Club at 7:00 p.m. on December 11. Four Sail Chicago instructors have successfully completed, or are in the final stages of completing, requirements for a US Coast Guard captain's license. Please congratulate Maureen Huston, Nick Brait, Norris Larson, and Dan Pilch. Members clearly prefer Monroe Harbor. Maintenance Manager, Joe Cannon, reports that wave action from storms and boat traffic is pummeling our fleet located at the mouth of Monroe Harbor. Joe will submit transfer requests to Westrec to move our boats further north in the Harbor. A member survey indicated a strong preference for Monroe Harbor. To simplify getting mooring permits onto each boat, Joe Cannon will collect and distribute all mooring permits in 2019. Frank McNamara, Joe Cannon, Adam Wisneski, and Bhargav Patel, our new IT coordinator, are working to automate Sail Chicago volunteer job opportunities to make it easier for members to sign-up for service time on line. This project also stems from results of the member survey done by Adam Wisneski and reflects an ongoing Board initiative to improve Sail Chicago volunteer opportunities.